A NOTE: Several years ago I pointed to the market the distinguishing style of Richter's hotel luggage labels. I was not particularly surprised when the market responded by identifying those labels by name, nor when they came to command better than average prices. However I was somewhat bewildered at seeing worthless designs treated as if they had a particular interest just because they were "signed by Richter". Actually fewer than half of Richter's many labels are really interesting (by design or otherwise) and less than 5% are really prime designs. In this essay I offer you an history of Richter, information on how to date their issues and my view of what is a great Richter label. Needless to say that my views are strictly personal, I do not aim to convert you to them and you should go by your own taste and not let mine influence you in the fruition of your own collection. Early Art Nouveau label by Richter & Co (early 1900s) not yet in the later ubiquitous "Borgoni Style". A SHORT HISTORY OF RICHTER: Richter & Co was established in 1842 by a Swiss printer, to produce chromolithographs in Naples. After the unification of Italy, Richter became a supplier to the royal household, specializing in several fields including the printing of bank notes. Around the turn of the century Mario Borgoni, a then young artist, started doing graphic work for the company. By the end of the XIX century Richter was printing promotional items for commercial ventures. Some clients were hotels and soon Richter was designing and printing all sorts of paper items for the burgeoning Italian hotel industry. 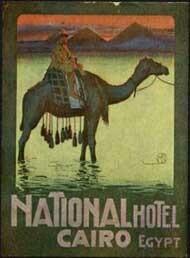 The first hotel labels were issued in 1900. By 1906 Mario Borgoni had become Richter's artistic director and the company was managing the graphic image of hotels all over Italy. At this time you should read my article on this artist by clicking HERE. Borgoni's Liberty style as applied by him to hotel labels established a trend that reigned supreme until the advent of the Deco Style. It meant success for Richter & Co who were soon selling labels of their design to hotels in most European countries, North Africa and the Middle East (Richter's work for Egyptian hotels is particularly noteworthy), the Far East, and even the Americas. Mario Borgoni was Richter's most influential graphic designer. His work is rarely signed but is often distinguishable by the masterly treatment of the human figure and the setting of scenes against an early morning or late afternoon sky. Some signed Borgoni posters were reduced for use as labels and these carry his monogram, the letters “MBi” inside a circle with an arabesque. The other noteworthy Richter artist signs his label designs with a monogram made up of varying stylized versions of the letters “PNI” (which may equally be "PNJ") and he worked under Borgoni’s artistic direction (from whom he borrowed the style) from the early 1900s to, at least, the 1920s. Borgoni left Richter in 1930, at the time when the shock waves of the Wall Street crash of 1929 started hitting the European hotel industry. His departure marks the end of the Golden Age of hotel luggage labels. During the 1930s Richter was reduced to issuing worsening reeditions of earlier designs and much inferior original work. After the war Richter reissued some earlier designs together with utterly uninteresting, albeit new, photographic labels before disappearing in the 1950s. It is not clear whether a book editor of the same name active in Naples at least until 1964 was related to the printer. DATING RICHTER LABELS Richter's signature varied during the half century of its activity as a label printer, and a knowledge of its evolution can come handy. The earliest signed Richter labels sport the mark "Richter & C” and this was used from about 1900 to the middle 1920s, coexisting with several alternate forms. Yet, the occurrence of early, anonymous, Italian labels with lettering in the Richter style suggests that the very first labels by this printer may have not been signed. In the early 1900s (and for a few years only) a number identifying the design was used associated with Richter's signature. At about the same time, the signature "Lit. Richter & C" was occasionally used until it was superseded by "Stab. Richter & C", used from about 1907 to 1914. After the First World War, only the old "Richter & C" seems to have been used for a number of years. It was customary for printers to freely copy designs from other printers whenever customers desired to reprint an old label. On November 1925 a law was passed in Italy to protect all graphic designs against copying, and in the late 1920s Richter's labels started to include a note to that effect: "Riproduzione vietata" ("Reproduction forbidden" sometimes in the language of the country where the hotel was located). Finally, in the 1930s, there were some changes to the type of society, so that after circa 1935 the signature used was "S.A. Richter & C" replaced a few years later by "S.p.a. Richter & C" which was used from just before the war until the last years of the company. WHAT IS A GREAT RICHTER LABEL? The best Richter labels are to be found amidst the earlier editions of the printer (typically from before 1910). The best designs center around a strong main motif, are often dark but not in excess (many of PNI's otherwise fine labels are so dark as to loose detail and suffer in consequence of that) and make use of a very limited number of colors. FINALLY... Richter & Co was different from other printers in several respects. Firstly, they contracted in-house artists and particularly Borgoni who had a catchy graphic style that was adequate for labels. When they made of him artistic director, they chose that style as their brand image and it became a sort of trade mark of the company. It made Richter famous in the field and it is the source of the desirability of its creations today. Then, and equally important, Richter conveniently offered the whole spread of services a client might need, including the full design of the graphic image of an hotel and all the paper items needed for promotional purposes. And finally, they internationalized their business very early by means of a force of traveling salesmen whose success is attested by the large number of clients in Egypt before WW I. In time they were widely envied and copied by other printers but their position in the market was already safe: they were the good designers and printers of hotel labels. Credits: Mr.Gioacchino Sciortino of Palermo, Italy for information on the origin and demise of Richter. NOTE: I tried long and hard to identify "PNI", the Good Artist of Richter. On the assumption that he had likely also designed posters and/or postcards, I reviewed available literature on the theme and ended up by a process of exclusion with only one candidate, an artist mentioned in the French Neudin postcard catalogue called "J.Paschal", active during WWI. This supposed that the monogram read "PNJ" and started by the family name which is not unusual. The hypothesis was supposedly confirmed by a French postcard specialist who, unfortunately, died before I could interview him and by an Italian collector who supplied no material proof. And so matters laid until a week ago. A week ago I was able to finally obtain a postcard dated 1908 illustrated by "Jules Paschal". Seemingly he is not French but rather Belgian from Verviers. And although his design has several features in common with the Good Artist of Richter, the lettering is different. And since the lettering, one of the most individual features of Art Nouveau, was a trademark of the artist, the card disproves my former identification. This view was further strengthened by the realization that several "PNI" labels had spelling mistakes in French (the label above for Grand Hotel des Bains has two spelling mistakes) and that this artist sometimes wrote the initial "I" with the same arabesque to the left that he uses on the last letter of his monogram (as he did in an early design for the Villa Igea Hotel). And so, it now seems to me that the monogram may indeed read "PNI" and that his family name may well start with an "N" and end with an "i" which he underlines with an arabesque to the left, as did Borgoni. This would make him Italian. And so I'm back where I started but now with a realization that "PNI" may be untraceable unless someone knows better. And a sad feeling that collectors trusted my assertion of authorship when it was likely wrong.